If Paul Holleran had any hair left he would surely be tearing it out as for the umpteenth time this season his side conceded a late goal which led to defeat in a game they could quite easily have won, writes Paul Edwards. Goals in the final few minutes against Hereford, Spennymoor (twice) and Stourbridge have seen Brakes lose games they should have taken a point from, while a late goal for Guiseley turned a potential three points into one and two late goals for Bradford Park Avenue made a three-goal cushion briefly look very precarious. It is certainly becoming a big headache for the manager and he will be growing tired of reinforcing the point that concentration needs to be maintained right until the final whistle if his side are to fulfil their potential this season. Connor Taylor shields the ball. With several of the squad under the weather due to a flu virus the manager opted to restore James Mace to the starting line-up after the completion of his three match suspension, with a very peaky looking Jamie Hood dropping to the bench. Connor Gudger and Colby Bishop both travelled with the squad and while Gudger hopes to be able to play a part in the next game, Holleran said that Bishop is still two to three weeks away but is looking very sharp in training. The afternoon could not have got off to a better start as Leamington moved ahead inside the opening 30 seconds. The ball was moved quickly out to the right wing where Kieran Dunbar sent in a dangerous cross that was glanced home by the head of Ahmed Obeng for his first goal of the season. Having stunned their hosts so early, a second goal would have provided a further boost but despite Brakes starting brightly there were few chances for either side. Jack Edwards was presented with a good opportunity when Matty Stenson broke into the box and unselfishly squared the ball to his team-mate, but although the volley was well struck it was straight at goalkeeper Luke Pilling. Brakes man-of-the-match James Mace made a welcome return. As the Robins began to find their feet, Matthew Chadwick directed a weak effort at Tony Breeden for Ashton’s first effort of the game and their equalising goal came in the 18th minute. A left-wing centre from skipper Matthew Regan was half-cleared to the edge of the box and Bradley Jackson took full advantage with a thumping first-time strike into the roof of the net. Some of the officials’ decision making left the visiting supporters scratching their heads, particularly when goal kicks were awarded after the ball had clearly deflected behind on four occasions. That frustration intensified when goalscorer Obeng limped off with a groin strain after over-stretching for a ball. Ashton were playing the ball out from the back at every opportunity, with Brakes seemingly content to allow them the space to do so as they were not working it into areas where they could cause problems. There was a sniff of a chance for Stenson shortly before half-time when he attempted to nod a fine diagonal ball into the box from Dunbar past keeper Pilling, who got there a whisker in front of the striker. Reece Flanagan was brought on just past the hour on his return to the club after Callum Gittings took a knock and his introduction was the catalyst for a spell of Leamington pressure, James Bowen thumping a 30-yard half-volley wide of the post. 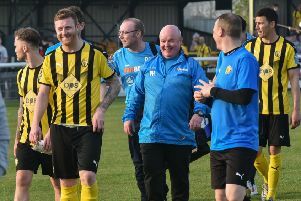 The home side continued to play the ball around well but infuriated both the Leamington players and supporters with their willingness to go to ground too easily when challenged. Fortunately for Brakes, when Chadwick tumbled to the turf inside the penalty area referee Paul Brown agreed with them and brandished a yellow card. Mace had a shot blocked on the line following a corner, while Sam Sheridan drove well wide at the other end. Stenson had Brakes’ best chance for a winner when substitute Connor Taylor was brought down inside the D, thrashing a powerful effort towards goal which was matched by an equally strong punch clear by Pilling. Ashton were adamant they had scored when Breeden produced a fantastic save from Regan’s thumping far-post header, several home players insisting the ball had crossed the line. They need not have worried, however, as in added time debutant substitute Liam Martin secured their first home league win of the season when he bundled the ball home from close range after a cross was allowed to reach him through a sea of bodies inside the six-yard box. Holleran admitted it was a bitter pill to swallow, especially after his side’s rip-roaring start. ‘Don’t get me wrong, in the second half I don’t think we got to the same levels. “We struggled a bit with the conditions but we needed a bit more quality at times. We didn’t work their keeper enough for some of the areas we got into. “You then get to the point where you’re thinking, it’s a tricky away trip, let’s just take the point and get back on the bus, but to get to the 92nd minute again - we were sloppy back there. “It’s not a good cross and it’s gone through so many people, it’s just difficult to understand how we haven’t dealt with it really.